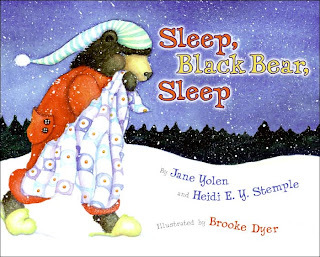 Sleep, Black Bear, Sleep is a wintery bedtime book written in rhyme. Each page says goodnight to a different animal in a different habitat, each drawn with a combination of human and animal details (for example, the gopher rests in an English cottage burrow). I am particularly impressed by the variety of words used for "sleep".